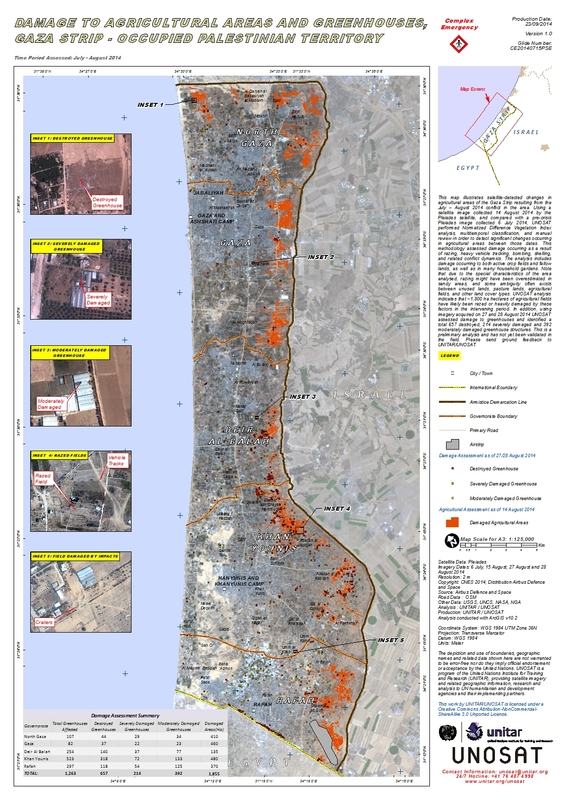 This map illustrates satellite-detected changes in agricultural areas of the Gaza Strip resulting from the July ? August 2014 conflict in the area. Using a satellite image collected 14 August 2014 by the Pleiades satellite, and compared with a pre-crisis Pleiades image collected 6 July 2014, UNOSAT performed Normalized Difference Vegetation Index analysis, multitemporal classification, and manual review in order to detect significant changes occurring in agricultural areas between those dates. This methodology assessed damage occurring as a result of razing, heavy vehicle tracking, bombing, shelling, and related conflict dynamics. The analysis includes damage occurring to both active crop fields and fallow lands, as well as in many household gardens. Note that due to the special characteristics of the area analysed, razing might have been overestimated in sandy areas, and some ambiguity often exists between unused lands, pasture lands, agricultural fields, and other land cover types. UNOSAT analysis indicates that ~1,800 hectares of agricultural fields have likely been razed or heavily damaged by these factors in the intervening period. In addition, using imagery acquired on 27 and 28 August 2014 UNOSAT assessed damage to greenhouses and identified a total 657 destroyed, 214 severely damaged and 392 moderately damaged greenhouse structures. This is a preliminary analysis and has not yet been validated in the field. Please send ground feedback to UNITAR/UNOSAT.